Help improve Atlas Obscura by expanding Virginia's Natural Tunnel with additional information or photos. 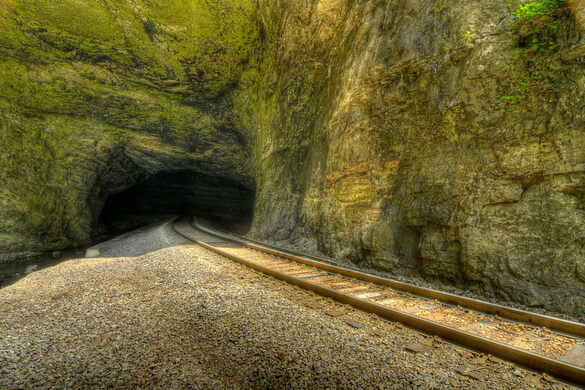 A stream flows through the tunnel alongside railroad tracks that have been in use for well over a hundred years. 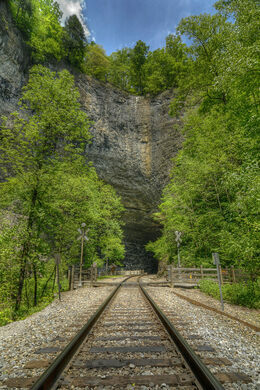 Sometimes mistaken for Natural Bridge near Lexington, VA, Natural Tunnel, however, is more impressive to some. The railroad is still in use—in fact, trains occasionally cross the path to the viewing platform near the tunnel entrance, so pay attention to the signals. This means that the closest you can get to the railroad is the platform, except for one day a year: Railroad Day. 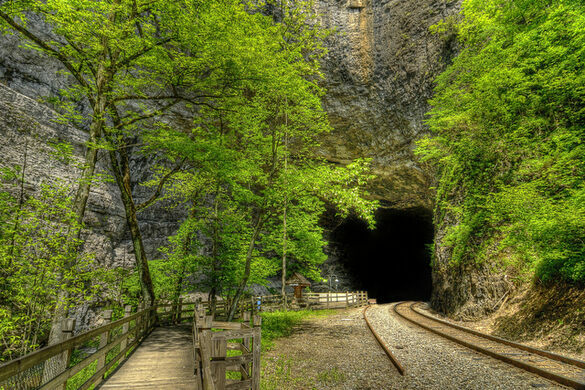 On Railroad Day, the railroad voluntarily shuts down and park visitors are allowed to walk through the cave. Lighting is operated by the park, and visitors walk directly on the tracks. Turns out there is light at the end of the tunnel. The parking lot for the tunnel is at the top of the valley, at the visitor center. It is possible to hike down to the tunnel, a switchback trail that drops several hundred feet quickly. Allow about 20 minutes for the hike down, about 30 for the climb back up. The trail is good, but it is not easy. As an alternative, there is a ski lift that runs during normal hours. From the lift, the tunnel is easily accessible on a boardwalk. During the Christmas season, lighted displays decorate the area around the lift. The park also has other excellent hiking trails, fine picnic and camping areas, and a restored 19th-century blockhouse like those that used to watch over the Wilderness Trail nearby. In addition, keep an eye out for posted events; the Park often provides guided hikes to places like Devils Bathtub or canoeing events on the Clinch River. You can climb to the summit of Black Mountain, as long as you sign the waiver. One street divides a single town that stands in two US states. A delightful park featuring homemade scale replicas of dinosaurs, tucked away in the Tennessee mountains. This maze-like slot canyon is a unique gem within an already fascinating geological area. Wee (and not so wee) footprints that insects and reptiles of the Paleozoic Era left behind.